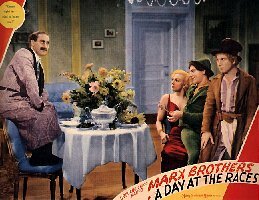 Sadly, this was the last picture the Marxes would make with Irving Thalberg. 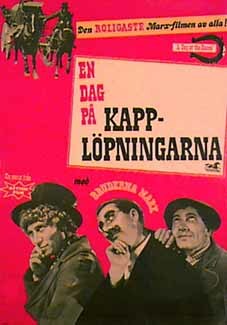 Thalberg died suddenly, at the age of 37, before the movie was complete. 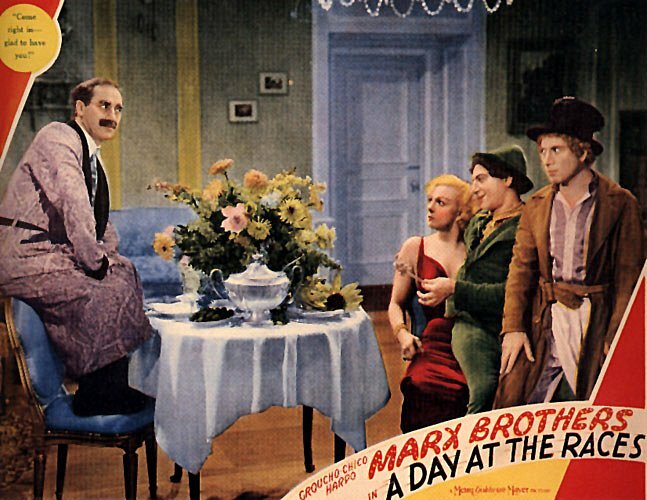 Although screen credit for the production of this film was given to director Sam Wood, Thalberg actually produced both this film and "A Night At The Opera." 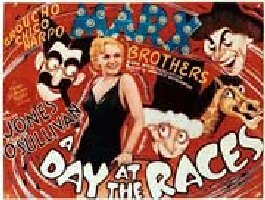 Groucho once asked Thalberg why he didn't give himself a screen credit. Thalberg's reply was that, "Credit is for others. If you are in a position to give yourself credit, then you don't need it." Also, "If the movie is good, they'll know who produced it. If it's bad, no one will care." 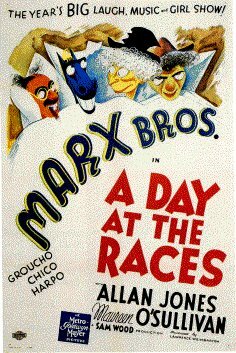 Thalberg employed an interesting method of test marketing in the making of both the movies he produced for the Marx Brothers. 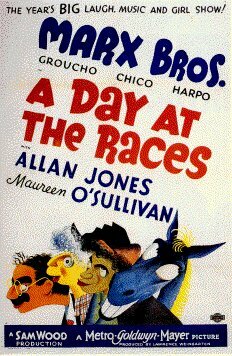 He sent the boys on the road with several scenes from the picture. Gauging the audience reaction, the writers and the Marxes were able to decide which bits were good and which needed to be changed or removed. This also helped the director, in that he knew how long the actors would have to pause to allow time for audience laughter. At the beginning of the film, we see Tony (Chico) trying to drum up business for the Standish Sanitarium, with little luck. The Sanitarium, owned by Judy Standish (Maureen O'Sullivan), is in financial trouble. A local hotel owner by the name of Morgan (Douglas Dumbrille) is trying by various means to gain control of the sanitarium to turn it into a casino. One of the sanitarium's residents, Mrs. Upjohn (Margaret Dumont), is willing to help out financially if Judy will hire Dr. Hugo Z. Hackenbush (Groucho) as her chief of staff. Does this sound familiar, "Duck Soup" fans? Neither of them realize that Hackenbush is, in reality, a horse doctor. Morgan and his sidekick, Whitmore (Leonard Ceeley), try desperately to uncover Hackenbush's shakey credentials. Meanwhile, Judy's fiance Gil (Allan Jones), is trying to help Judy out as well. 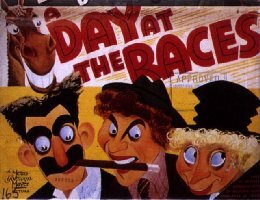 To this end he purchases a horse with the intention of turning him into a winner at the track, with the help of Tony and jockey Stuffy (Harpo). 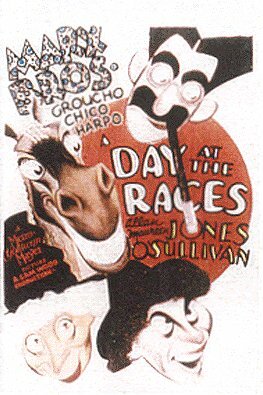 This picture contains yet another inspired bit of banter between Groucho and Chico, in the "Tutsi-Fruitsi" scene. 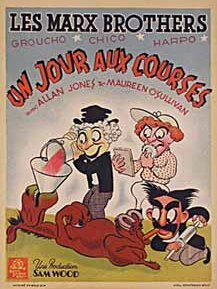 And watch out for an insane phone call to Florida, Chico selling race tips, Groucho's nutty medical exams and Harpo completely destroying a piano turning it into a harp. 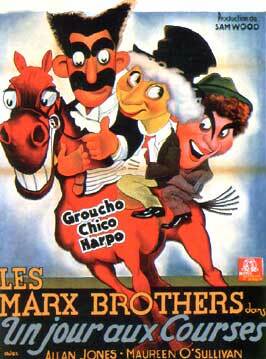 The Marx Brothers continued to make movies after Thalberg's death, but their hearts (especially Groucho's) just weren't in it anymore. From now on they would be at the mercy of MGM, which was never terribly fond of them in the first place. Note: The photograph at the top of this page is not from the movie; it is a publicity shot taken of the Marxes and Irving Thalberg around the time of the film's production. TONY: Hey, come here. 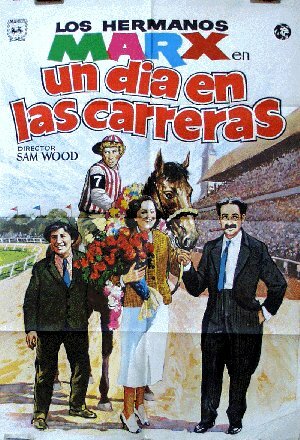 Sun-Up is the worst horse on the track. HACKENBUSH: I notice he wins all the time. TONY: Aw, that's-a just because he comes in first.